This restaurant was introduced in the Kodoku no Gurume 4 Ep02. 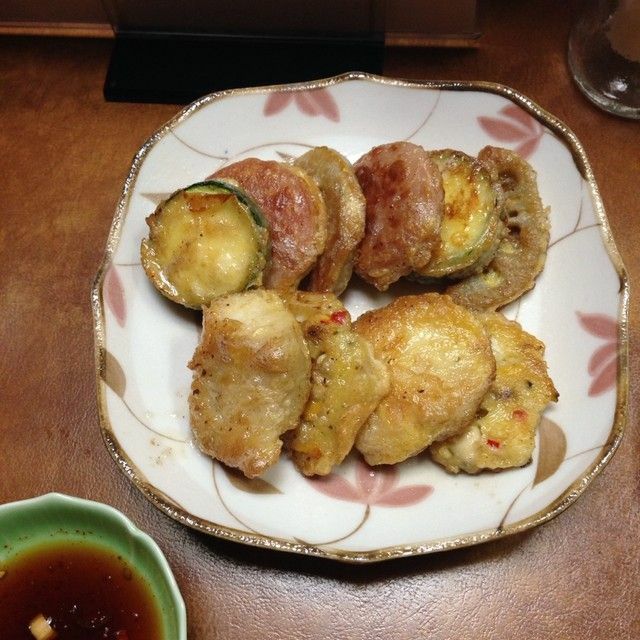 The place of “Najimi-tei” is Ginza, address-wise, but almost Shimbashi. 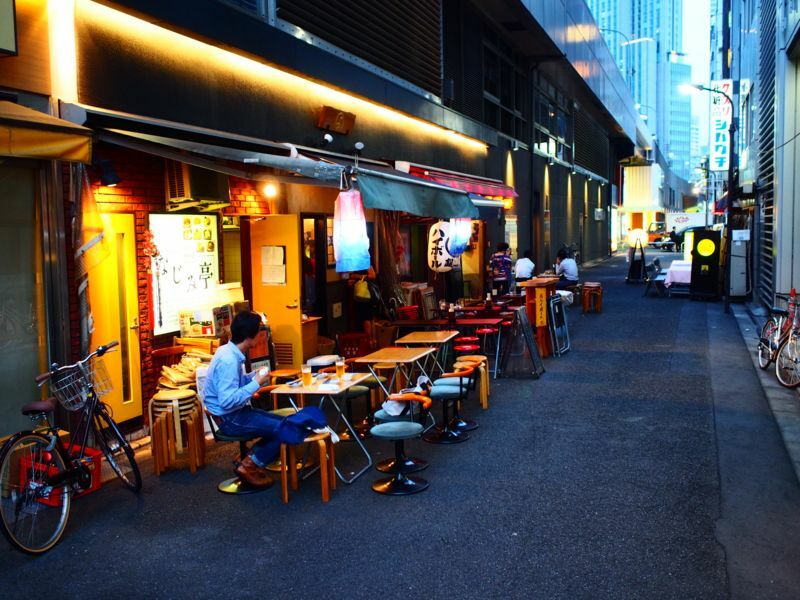 It is located 1-2 minutes on foot from Shimbashi station. Until now, this road has passed many times, but I did not think that this place would be such an important place! I made a reservation, but the inside of the shop is already full. I passed through the terrace seat in front of the store. Since it was after broadcasting, I thought that an awesome matrix was formed, it seemed like a calm situation at first glance. However, after a seat I seated, many customers visited, but clerks declined them “I’m reserved”. I could not put it in the store, but it seemed much narrower than when I saw it on television, when I looked in a bit when I opened the door. In the drama, it was shooting with a wide-angle lens, so it seems that it was only wider than it actually was. The menu menu which should be arranged in the dishes inside the store was also sticked out of the store. Indeed, they seem to be homely and tasty. The menu seems to change daily, there seems to be some things other than the one where the picture comes out, and the clerk explained it. By the way, I was working with a Korean mother and a Japanese boy. The sister was part-time job that was adopted two weeks ago in anticipation of congestion after broadcasting! 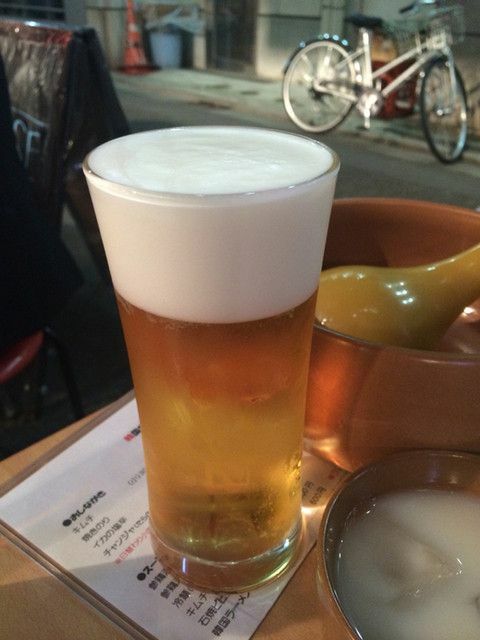 If you asked for some dishes, first of all, I wish you a cup of beer. I feel like I got some sort of beer that I can drink outdoors at the edge of this kind of Ginza. It might have been a good time as it would have been unwilling to drink outside if it was hot. Stewed food is simmered in Chikuwa. It’s a bit spicy and it fits beer. Although it is crowded, it seems that cooking is basically done by mother alone, or it is late to come out. 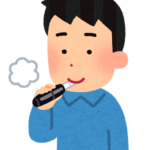 However, it is useless since it is just after broadcasting. 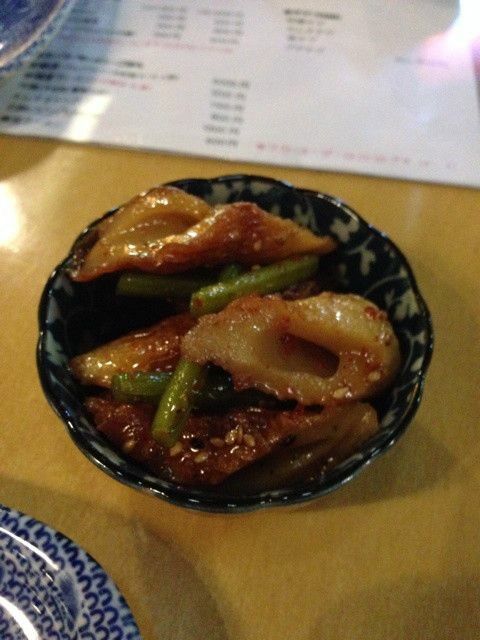 It is a dish not on the menu, but something of bamboo shoots. Bamboo shoots that I have never ever had! Chicken meat in the middle hollowing out a very soft cooked bamboo shoot? 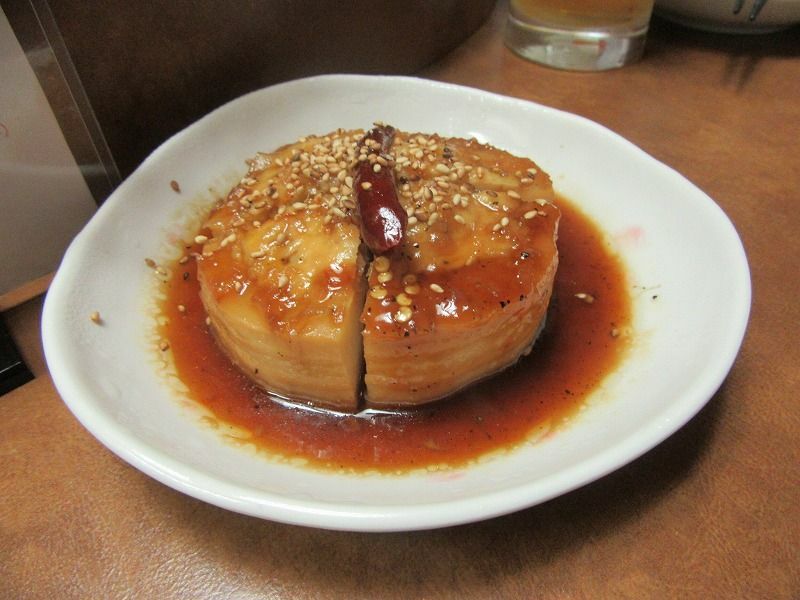 Stuffed with bean paste, sprinkle plenty of black pepper. I never ate such a Korean cuisine. Suddenly today’s hit food is confirmed. Subsequently, boiled fish which was also not found in the menu. In the ones that were in the menu, the fish gyoza and chapche that appeared in the TV series were unfortunately sold out, but this boiled fish instead. If the fish is cod cod! (← About boiled fish in Japan, it is the price that soup stock or boiled with soy sauce is the market price, and if boiled fish comes out like men’s stomach, it makes me feel unsatisfied, but this is a Japanese boiled fish and It is totally different, boiled fish with satisfactory feeling even with a man with a tangy flavor with spicy spicy. 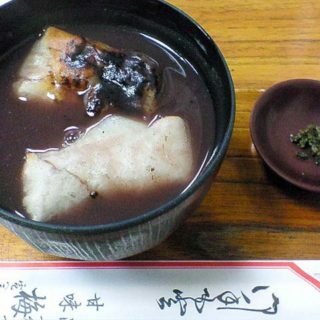 It is a boiled fish which can not be easily eaten in Japan! And Korean style tempura. It is made by fried and grilled some kinds of fish ‘s surimi, and you should have a sauce like something to put on the tip. It is warm and gentle taste. The food is delicious! I wanted to drink ‘Black bean makgeolli’ which Kusumi drinks on TV series. 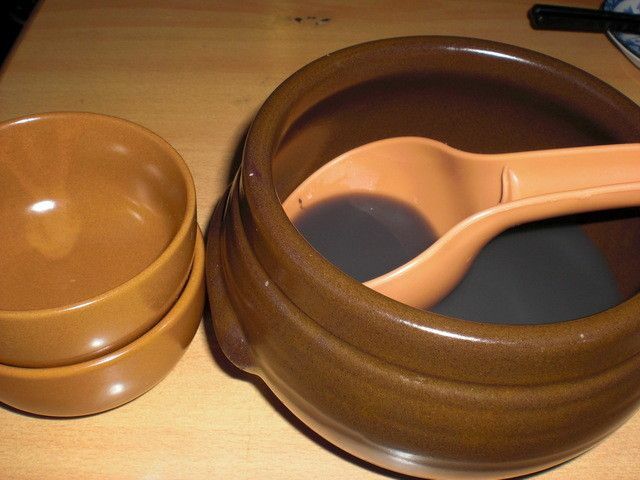 This is sweet, compared to ordinary makgeolli, the smell of black bean gives the taste deep, it is delicious. The appearance is quite intense, but it does not understand from its appearance. The pace at which the dishes came out was slow, so I drank a lot. I wanted to eat with black bean makgeoli and asked for kimchi. I was surprised to hear that if you asked me “Do you want me to make it big or small?” If you have kimchi you can drink anything, so I ordered the big. Or rather, I changed my kimchi after this. This kimchee is rather hot and I want rice instead of meeting sweet makgeolli. Further snacks, Korean paste. This is service from mother. We are offering Korean garbage to customers at other tables, or “I got a lot of makgeoli” so I can do a pretty good service. And this is Possum Kimchi who was more concerned than the main Chicken Yu Ramen. It is a set of thick steamed pork and kimchi. I just ate kimchi when I thought about it. 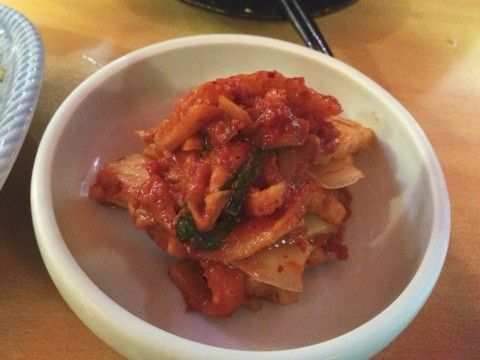 But, since it is a Korean restaurant, you can eat kimchi a lot. Let’s put kimchi on this pork. It is a good thing that does not disappoint. Kimchi and pork make it fit. 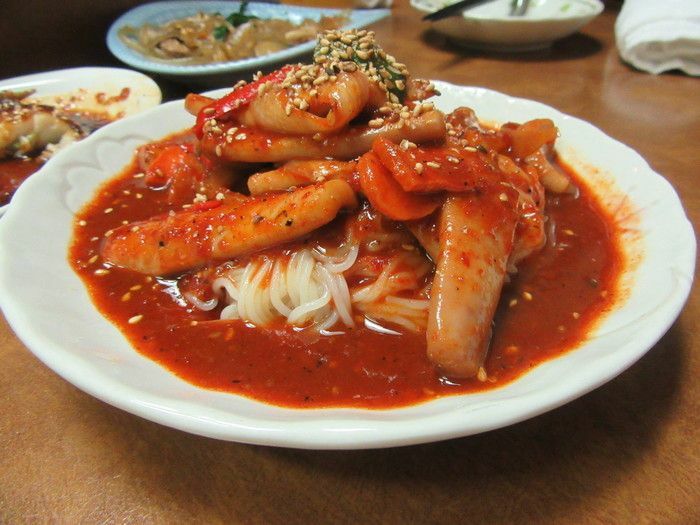 Stir-fried squid and somen’s spicy dish, which Gorow was eating here as well. Although it looks spicy because it seems to be spicy, compared with the straight spicy of Kimchi, it is only called “spicy”, it feels sweet in the first mouth, the spicyness type that comes in aftertaste. Boiled fish is good, called Somen, good for Japanese people to eat as much as you like, just to distinguish this taste so much, the culture is quite different even though it is a neighboring country. 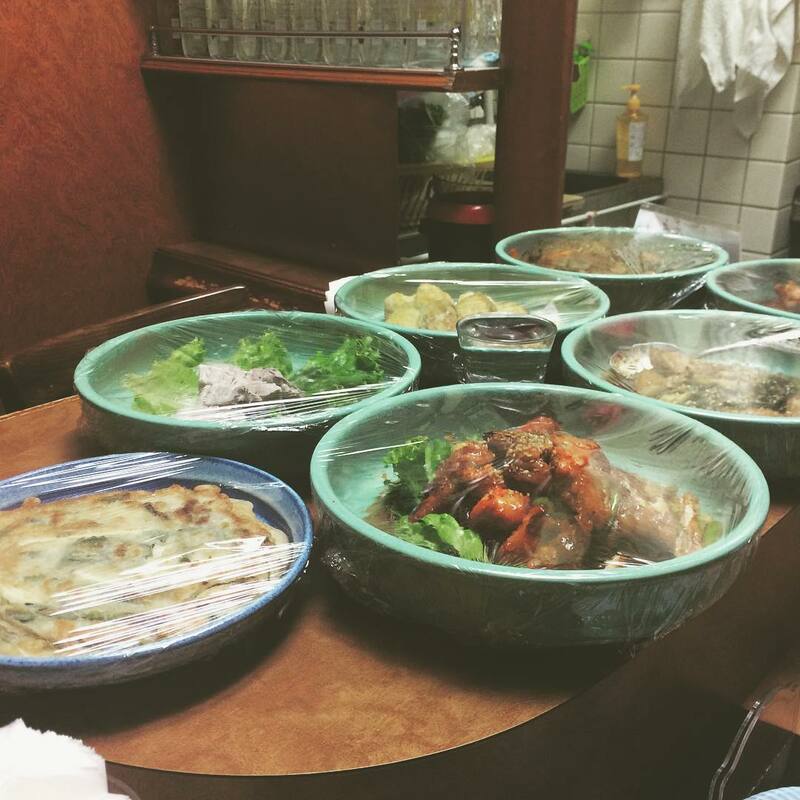 Anyway, I’m happy that you can eat various side dishes little by little. Even so far I was pretty much full of stomach, but I wanted to eat the most, I ordered a rice noodle. Oh! Was this chicken hot spring ramen, it takes time and effort to make, I made three tables for collecting and put out. By the way, it seems that this is only 10 meals a day! Noodle, as introduced in the TV series, instant noodles. It is instant though it is made from this crackling plenty, but instantly like salty taste firmly attached to the noodles themselves. 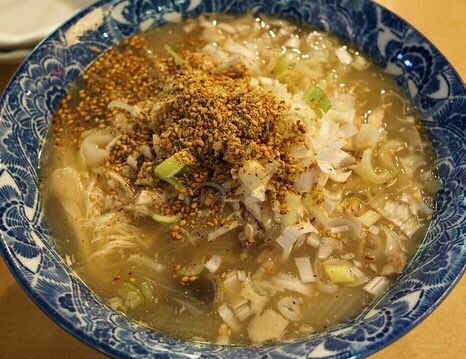 The combination of this cheap salty noodle is innovative to the gentle taste of Kinsuke hot stewed with various things carefully. Instant superior. No, instant is the taste of. If you were using ordinary noodles, it must have been strangely blurred ramen. It was delicious! Tiredness blew away. My mother-sama, even though he was busy, he did not smile, and he was comfortable with friendly action. Although I was very satisfied, it was surprising that I could not find the chapty and fish dumplings and the inside of the store could not be seen. This only comes once again when the congestion calms down.